Ren is an Archaeologist with a very serious edge-she can connect to the spirits of the departed, and they guide her towards important finds on archaeological dig sites, bring her perspective, and even offer her comfort in life. Are these spirits real or are they figments of her imagination? Is she insane? She doesn’t share her secret with just anyone, in fact, she tends to keep most of her secrets to herself, including the tragic loss of her brother when she was 12 years old, an experience from which she has never recovered. One particular dig site is bringing some new challenges for her… Workers have discovered pieces of a bowl that may show a link between two very distant sites, which could be a huge archaeological find, signifying movement of indigenous people that could tell a great deal about the period in time. On top of the archaeological excitement in store for Ren, there is a very handsome colleague on the site who has taken a particular interest in her, both personally and professionally. Can Ren find enough peace to share her truths with Silas, or will her burden remain her own? What do the spirits want from her, and why are they appearing with cryptic messages? 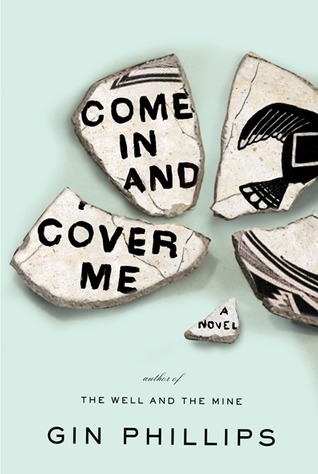 Anyone who likes archaeology will be very interested in Come In and Cover Me, by Gin Phillips. American archaeological studies about indigenous people make up a very interesting and colorful historical journey, mixed with serious soul-searching, and heavy on the spiritual, this novel is unlike any other I have read, and this time, that’s a good thing.